Ontario Premier Doug Ford has finally unveiled his much-touted, $28.5-billion plan for new transit infrastructure in the Greater Toronto Area. There are still many questions left to be answered about funding, planning and timelines. Ontario Premier Doug Ford has finally unveiled his much-touted, $28.5-billion plan for new transit infrastructure in the Greater Toronto Area. A new 15-kilometre "Ontario Line," which would replace the City of Toronto's plan for a downtown relief line. A three-stop Scarborough subway extension. A Yonge-North subway extension that would connect Line 1 to Richmond Hill. A westward extension to the Eglinton Crosstown West, part of which would be built underground. According to Ford, the province will spend $11.5 billion on the four projects, leaving nearly $17 billion unaccounted for. It's not clear how much the federal government may be willing to commit or how the City of Toronto and York Region will come up with their portion of the funds. Toronto has already sunk some $200 million into various projects that will be affected by the province's plans. The province did say, however, that it has allocated funding allotments based on an assumption that Ottawa will cover up to 40 per cent of the costs of new builds. This project would intersect Line 1 and connect Ontario Place to the Ontario Science Centre. Starting from Ontario Place, the "free-standing" light rail line would go to Osgoode and Queen stations, then to a new East Harbour stop. From there, it would head north to Pape station, before travelling still further north to the Science Centre. 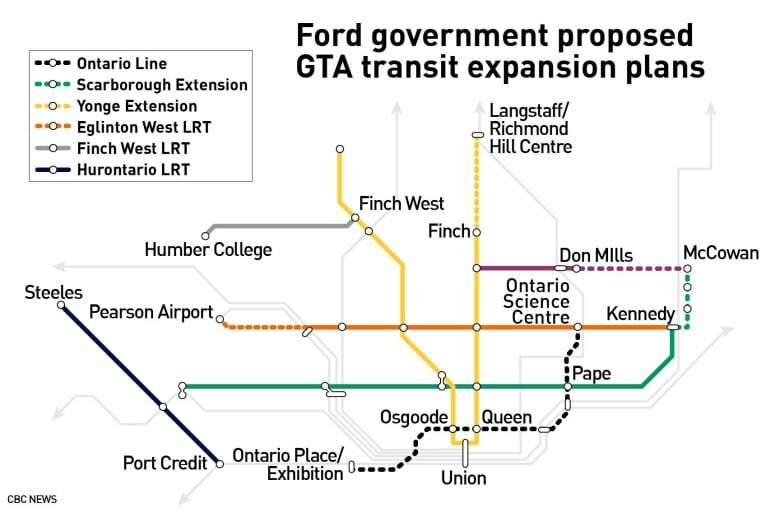 It would also connect to the Eglinton Crosstown LRT. The line will be built mostly underground, the province says, though some stretches may be aboveground. The Ontario Line is intended to replace the original Downtown Relief Line that has already been planned and approved by the City of Toronto, but would be double its length. 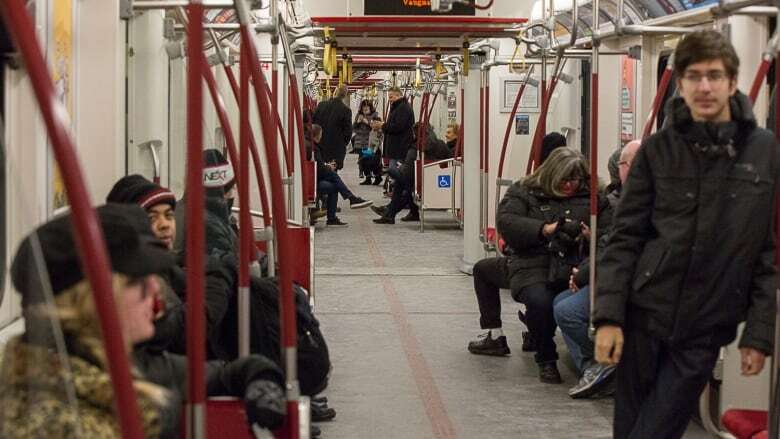 The province said the line would divert up to 9,000 transit riders from Line 1 during weekday peak hours and about 55,000 in total on weekdays. According to the province, the Ontario Line will be "independent" of the Toronto Transit Commission (TTC). Estimated completion date: 2029, though the province says it is possible the project could be finished two years earlier in 2027. This proposed project is an extension of Line 2 north from Kennedy station, with stops at Lawrence East and Scarborough Town Centre stations before terminating northbound at McCowan station. The Scarborough subway extension has been deeply controversial among councillors at Toronto city hall. An initial plan for a seven-stop light rail line was scrapped by council under Ford's brother, former Toronto Mayor Rob Ford, in favour of a subway. 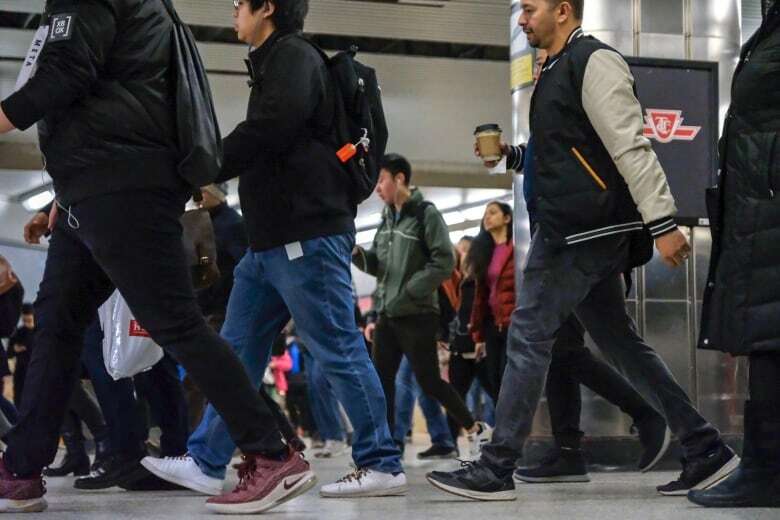 After a seemingly never-ending debate, the city settled on a one-stop proposal that would have seen Line 2 (Bloor-Danforth) extended to Scarborough Town Centre at a projected cost of $3.9 billion. But Ford and Ontario Transportation Minister Jeff Yurek made it clear earlier this year that the province favoured a three-stop plan, with the private sector possibly stepping in to fill a billion-dollar funding gap for the project. However, Ford now says that the province is willing to cover all the costs of the project. Estimated completion date: 2030, which is notable because the Scarborough RT is expected to be taken off-line around 2026, meaning residents there could face years of bus trips until the subway extension is completed. This proposed project is an extension of Line 1 from Finch station north to Richmond Hill Centre. The work would extend Line 1 outside of Toronto city limits to York Region and will be done in conjunction with construction on the new Ontario Line. The province says the Yonge-North Subway Extension would open after the Ontario Line. This project is an extension of the Eglinton Crosstown project west into Etobicoke. The province said it wants this line to provide more service along Eglinton Avenue West to Renforth Drive. It also wants a portion of this extension to be underground, primarily between Royal York Road and Martin Grove Road. Ultimately, the province said it would like to connect this extension to Toronto's Pearson International Airport. Estimated completion date: "Before 2031," according to the province. The province says it "remains committed" to extending the Sheppard subway line from its current terminus at Don Mills station to McCowan station, where it would meet the Scarborough subway extension. No estimate of cost or completion date for the project was provided by the province at its unveiling of the other projects, but a news release said it will "begin exploratory work on cost and completion timelines to lock in the project for a future build date following the completion of the Scarborough Subway Extension" in 2030 or so.